March 20, 2019 – All of Ruby and Gunner’s pups have gone home to live with their forever families. We’re hearing good reports that everyone is settling in nicely to their happily ever after. This was a special litter, for sure. We’re thrilled to see all the happiness created by this litter of pups. 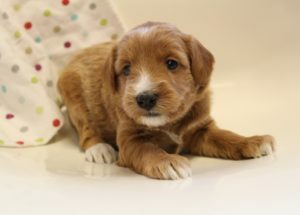 One puppy went to live in Iowa and will become a sire for Cedarbend Labradoodles there. 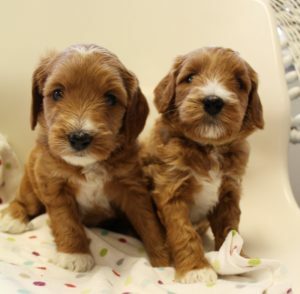 Two of the pups will stay in the Valley Vineyard Labradoodles family to hopefully become mamas and help us continue to produce more of this great line of mini’s. And three pups went to live with families that had waited a pretty long time! We were able to donate $900.00 to Amazima Ministries because of the families that adopted from this litter. Because of them, and Ruby and Gunner of course, more kids in Uganda get to eat, have shelter and get an education. Hard work done, to help others in need. Thank you all! We messed up and didn’t get family pictures, but we’ll post them as they are sent to us! We wish for the BEST for each puppy and their new families! March 7, 2019 – The puppies are now seven weeks old and yesterday they had their final vet exams, micro-chipping and nails trimmed, and first round of vaccinations. They are fully wormed now and the vet showed every pup to be in great health. We’ve been working on leash training and sitting. They’re understanding things and very smart. We are bringing them out into other areas of the house, helping them become comfortable in being totally away from their siblings, and none of them are showing any anxieties. They love humans! They are all confident and pretty self-assured. All are affectionate and love to be held. They had their temperament testing done today as well and all pups did well on that too. They’re showing slightly different personalities, but at seven to eight weeks old, personality is just starting to show. We noted below what we see and what the trainer/tester saw in their Volhard temperament testing scores. So much of the scoring was similar. Each pup did great when challenged and tested on sight, sound and touch, and were submissive yet self-assured. Each scored great as a good family pet that is adaptable and easily controlled. Each shows that they will look to their master for leadership and will bond closely with their humans. All engage well with humans and like to play, but all also love to be in someone’s lap. For social interaction, all scored as pups that are outgoing and friendly, with a flexible temperament that adapts well to different environments. On restraint testing and dominance, all showed to be submissive. Really we see just some slight differences in personality that are noted below. They all love affection and are very affectionate. Keep in mind, that what we see consistently in our pups is that their personalities are just beginning to form as they go home to their forever families. We see they tend to mesh to their new environments and take on the confidence, guidance and energy level of their new pack leaders. Each of these pups will do excellent with their new families, including any new animals that they will be joining in their new homes. Fudge – Fudge has shown to be the most laid back, least reactive and what some trainers would call “a couch potato.” Since he was only a few weeks old, we saw this. Just a “whatever” attitude and not really an excitable pup. Pretty chilled out and often observing more than engaging. Cobbler – Cobbler scored as and shows to be a little more independent and confident. He is very playful and interactive, and has more energy than his brother (what trainers like) but will immediately settle down quickly in your arms and totally loves sitting quietly with his humans. Sundae – Sundae scored as very outgoing, a little more than her brothers, confident and self assured, also submissive and a great family pet. Easily controlled and adaptable, just as the rest. Brulee‘ – Brulee’ is growing in confidence. Likes to observe a little more at first before jumping in to something new that’s going on. Eclaire – Eclaire scored as super confident, does well with new things (will jump right in) and loves new experiences, and perhaps a bit more of a leader than a follower. Perhaps she will be a little more adventurous than Brulee’ but time will tell. Shortcake – Very playful, independent, not as focused as her brothers on commands. Very confident. Perhaps a leader of the pack. Here they are at seven weeks old! February 28, 2019 – The puppies are six weeks old now and it’s time for their individual picture shots! They are doing so well. They are still very calm, quiet and love to be held. They love humans and love for us to pick them up. We’re working on “manding,” which means that they need to sit for attention, to be picked up or to be pet. They sleep in a crate, mostly, together each night now. We’ll start working on individual crate time over the next two weeks. They love their kibble, but are still nursing with mama a couple of times a day. They play and chase and wrestle more now, but their main focus continues to be wanting to sit in somebody’s lap (this is our therapy line.) They track us and watch what the humans are doing, all good signs that they have come along well in their social interaction and connection to their humans. They are going to be outstanding dogs. They are well on their way! Here they are at six weeks old. 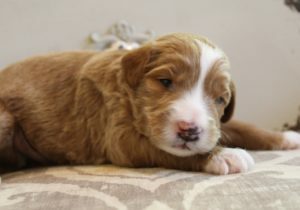 February 13, 2019 – The puppies are four weeks old today! They still seem so tiny when we’re so used to dealing with the medium and standard size pups. So cute! Today we started litter box training them and they’re having their first taste of kibble as I’m writing this. They had play time out in the big play area with the bigger dogs to let them experience something new. We’ve been doing lots of sound desensitizing and they seem pretty calm and relaxed through every new experience. They’ve had countless baths already and they don’t seem to mind anything. This is the way we like them! They’re right where they’re supposed to be at this stage. Well, here are the pictures we took of them today. Hanging out in the pen. Litter box has just been added. February 7, 2019 – The puppies are starting to react to sound a little bit. It’s typical that they begin to hear right around three weeks of age. So we’re working on sound desensitization and they are now listening to fireworks, trains, thunderstorms and loud traffic (Youtube is great for this stuff!). We’re done with the Bio-sensor program and we focus more now on massaging and getting them really comfortable with baths and people. We’ll post more individual pictures next week at four weeks old! January 31, 2019 – Are you ready to see these cutie pies??? Oh.my.gosh. Here they are at two weeks old. Cobbler, Boy. Some of the pups pigmentation is still in the process of darkening. As with Cobbler and his spotted nose. Fudge, Boy. Fudge is sleepy. January 30, 2019 – The puppies are two weeks old today! They all opened their eyes yesterday and started walking around. No more crawling. They are absolutely adorable with the cutest coats and white markings in all the right places. They’ve tripled in weight and this picture shows you how big they are compared to their mama and the pictures we posted last week. Incredible. We’re finishing up with the daily Bio-sensor program with them soon and they have had lots of baths under warm running water (they love it) and lots of holding time and massages. They can’t hear yet. That’s next week. We’ll be posting individual pictures of each of them tomorrow. 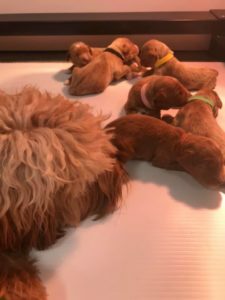 January 22, 2019 – The puppies are a week old now and they are doing great! There hasn’t been much to report yet as we are just watching them eat and sleep. Mama does a great job, and we make sure she is fed and happy as we help her watch over them. They’ve gained weight each day and are strong and active as they crawl around the litter (unable to see or hear at this point.) They feel and smell their way to mama. All of the puppies are around one pound in weight now. We started the Bio-sensor program with them several days ago, and in addition to that, they are held and massaged daily. This is critical neurological stimulation for them, as well as they are becoming accustomed to being touched and held by humans.The black railing around the pen keeps the pups safe from being crushed accidentally by mama. It stops her from fully laying back on them. Soon they can have warm blankets in there. We keep the blankets out for the first ten days so it’s easier for them to squirm to mama. The heat lamp is still critical to keep the pen temperature close to 80 degrees until their bodies can regulate their own temperatures. They are all going to be really cute puppies! Can’t wait until they grow a bit and we can take individual pictures of them. We’ll do that at two weeks of age. Here’s a glimpse of their pen today. Fudge is the darker one sleeping on top of the others. From left to right: Cobbler, Sundae, Shortcake and Eclair. Brulee. They’re all so tiny at this point. Cobbler is the one in the background with the black collar and white markings. He’s a boy. Fudge is the darker boy. He’s got his head on top of Shortcake. Annie Ruby is a great mama. Never leaves their side. Here they are nursing. January 16, 2018 – Today was a good day. It was stress-free for Mama Annie Ruby who brought us six healthy and cute caramel and red puppies. They all weighed in at a healthy birth weight (we love that!) and are between ten and eleven ounces. They all came out strong and started nursing right away. We have four girls and two boys and we’re naming this litter: The Dessert Litter. Welcome to our world Sundae, Eclair, Shortcake, Brulee’, Cobbler and Fudge! We’re glad you’re here. The babies are two hours old here. Mama needs a bath. That’s for tomorrow.